TP-Link SOHO Community > < Stories > How to Connect to Your WiFi Without Needing the WiFi Name or Password. In today world, security is a paramount concern, especially when it comes to your wireless network. We will often create a WiFi network with a long and complicated password. Remembering this password can be a chore. You may have forgot it and can’t add your brand-new device. You may have to pull out a computer to connect directly to the router to find out what the password is. Or, even reset the router and be forced to setup every device again. This can especially frustrating when friends and family visit and try to connect to the network. To address this TP-Link is proud to announce our auto connecting technology—WIFI QR code. Simply go to “Advanced---Wireless---Wireless Settings”, click “Sharing Network” and a QR code will generate. Open the camera app on your devices and scan this QR code. Your devices will automatically connect to the you TP-Link router’s WiFi. Note: your camera or app will need to support QR code scanning. You can click “Save Picture” and print the QR code. Then you can put it in your home or business for your guest to easily and conveniently connect to your WiFi. WIFI QR code is currently supported on the Archer A7 version 5 using the latest firmware. 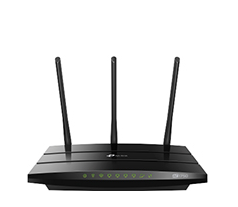 This feature will be added to other TP-Link SOHO routers in the future.